The Colonial Inn was built in 1838 as the Orange Hotel; as of 2016 its future is in jeopardy from a negligent owner. The subscriber would respectfully inform the public that this large and commodious establishment, situated on the street leading directly west from the Court House is now open for the reception of travelers and Regular Boarders. Having erected this building especially for a hotel, no expense or pains will be spared to give it character abroad; his customers may thereafter rest assured that his accomodations will be good. In 1841, Richardson Nichols purchased the property from Spencer, and expanded the main structure. In 1856, Nichols sold the structure to the "Hillsborough Improvement Company," which consisted of Alfred, Henry, and Calvin Stroud. The 1860 census for Hillsboro lists Henry C. Stroud as a "Hotel Keeper" with ten boarders (in addition to several laborers and family members) living in his household, and an 1867 ad for the hotel names Alfred P. Stroud as the proprietor of the business (see image below). The Strouds lost the property via bankruptcy in 1868. Parks had the hotel complex drastically remodeled and altered, namely by designer Jule Gilmer Korner, a.k.a. Reuben Rink, who was "famous" for his design work for the W.T. Blackwell Bull Durham Tobacco Company and for Julian S. Carr. 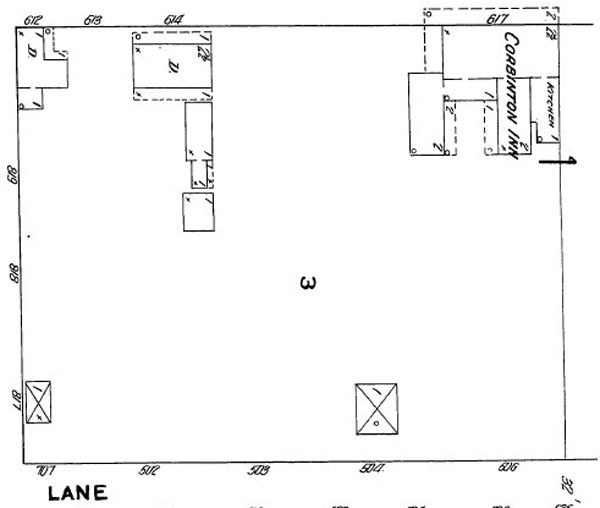 By 1894 (see map below), the hotel property had been "consolidated," and appears to have only consisted of the main structure (on Lot 15), the other structures reverting back to a dwelling and various outbuildings. 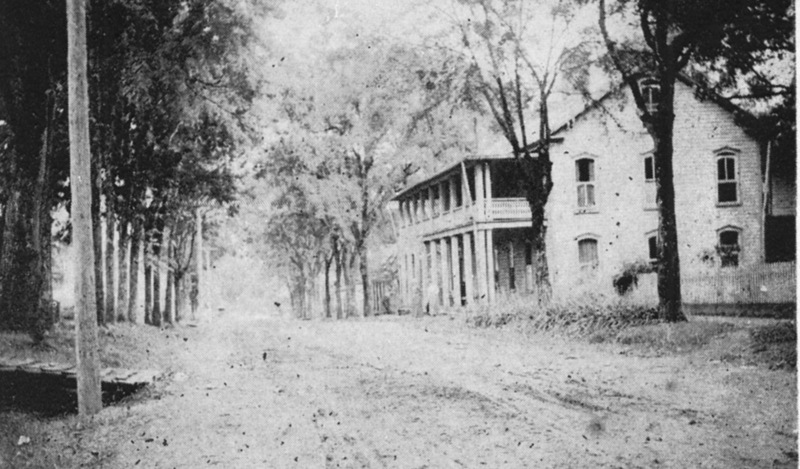 In 1908, Thomas A. Corbin purchased the property and renamed the complex the "Corbinton Inn," after his name and one of Hillsborough's earlier designations (Corbinton/Corbin Town, from the 1760s). Corbin had the structure significantly expanded during his ownership. In 1921, W.L. 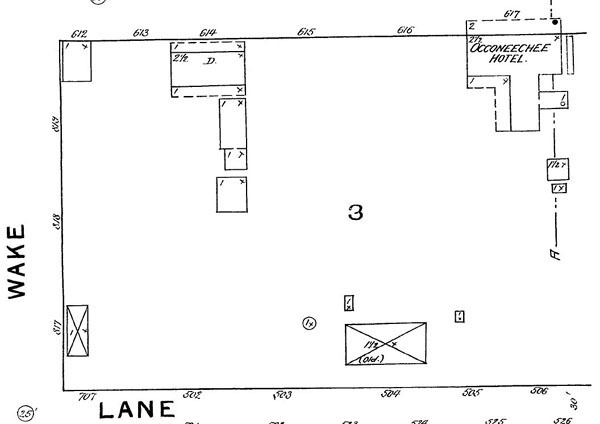 Foushee apparently purchased the property from a H. L. Akers, and by 1924 renamed the hotel the "Colonial Inn" (see map excerpt below). In 1946, Paul Henderson purchased the property from Foushee, and was commended by Hillsborough's residents for renovating the structure, as apparently it had fallen into disrepair. During Henderson's ownership, a "fine-dining" restaurant was added within the hotel structure. The Inn was a popular destination for Sunday dinner. In December 1952, Charles and Ann Crawford purchased the property and business, and expanded the structure. They operated the business successfully until they in turn sold it to James and Maxine Freeland in 1969. The Freelands also expanded the structure and continued the hotel and restaurant business at the location. 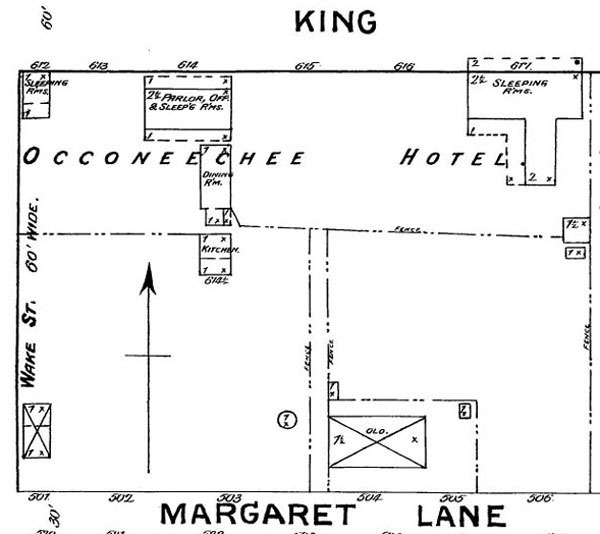 Back in the early days of the 1900s, the Colonial Inn was called the "Occoneechee Hotel." It was well cared for, being in the capable hands of Mrs. Thomas Lynch, aided by various helpers. In spite of the help, however, the chief responsibility fell upon her shoulders, and her days were busy indeed, but Mrs. Lynch did make time to have some flowers on hand. Back of the hotel, a neat wooden fence furnished the background for a bright bed of flowers, probably zinnias and marigolds. Back of the fence lay a very pretty and well-kept vegetable garden. In the side yard stood a white althea, so large that the little boy who lived there said it was practically a tree. Talking of trees, the giant of them all was a huge mulberry tree, which shaded a large part of the back· yard, furnishing an ideal place for preparing fruits and vegetables in cool comfort and peace. Along the line of the sidewalk, between the Parks-Richmond House and the hotel itself, there stood then, and stands now, a mass of day lilies, brightening up the walk on July and August days. Cool shade, bright flowers, comfortable chairs, and good food, these were the special pleasures of the 'drummers' and traveling salesmen, who came on the train and 'put up' at the hotel. Before and after supper, the big rocking chairs lined up on the front porch were soon occupied by the drummers and some of the guests of the hotel, who joined in the conversation, the jokes, the laughter, and the fun. These were pleasant days and pleasant company. The Inn closed for business in 2001. 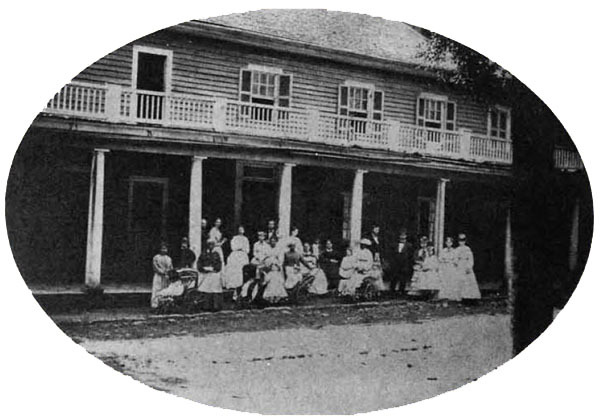 In 2003, the Colonial Inn was sold at auction and purchased by Francis Henry of Chapel Hill. Henry had abused a previous historic property in Chapel Hill, resulting in eventual demolition, and has stayed true to form with his treatment of the Colonial Inn. Along with consistent neglect, Henry has burned trash in the fireplaces, which seems bizarre unless he somehow hoped the property would burn down. After 12 years of frustrating back and forth with Henry, the Town of Hillsborough voted to begin eminent domain proceedings in March of 2016. There is little news as to the status of the process, although someone put a new metal roof on the structure in May of 2016. January 2002: Orange County sheriff conducts an auction to sell the property. April 2002: A deed is recorded formalizing the sale of the property to Colonial Inn LLC for a price of $410,000. September 2003: The town receives two letters of complaint from citizens alleging demolition by neglect at the property. November 2003: The structure is given a “Statewide Significance” designation by the State Historic Preservation Office based on an application by Cathleen Turner, executive director of the Alliance for Historic Hillsborough. February 2004: Demolition-by-neglect notices are hand-delivered to the owner, Francis Henry. The town conducts a public hearing on the demolition-by-neglect complaint. The ruling confirms that demolition by neglect is occurring and orders specific repairs with time frames. March 2004: Civil penalties by the town commence because no corrective actions are taken within the 30-day time frame given in the repair order. April 2004: Real estate for sale signs appear on the property. A lawsuit filed by the town and a counter-lawsuit begin regarding the prevention-of-demolition-by-neglect process and the repair order from the town. June 2005: A settlement is reached, with $2,500 paid by the owner to the town for preservation purposes. April 2007: The town adopts a new Prevention of Demolition by Neglect Ordinance. August 2007: The owner applies for permission to demolish the structure’s rear addition, make repairs and re-roof the structure. A Certificate of Appropriateness is granted by the Hillsborough Historic District Commission. September 2007: A rezoning request is made by the owner to change the property from its R20 residential zoning to a “Central Commercial” zoning. A protest petition is filed by adjoining property owners. October 2007: A public hearing on the rezoning request is conducted by the town. Testimony indicates that the 1986 zoning decision was a conscious choice by the town and not a mistake as contended in the application. See the hearing minutes. November 2007: The Hillsborough Planning Board recommends denial of the rezoning request, indicating that the residential zoning was not a mistake and that better tools exist to protect the structure. January 2008: The Hillsborough Board of Commissioners and the owner meet to discuss the rezoning request; the owner verbally withdraws the rezoning request. See meeting minutes. July 2008: The town receives a complaint letter alleging demolition by neglect of the structure. September 2008: Town staff give formal notification of the complaint to the property owner and Historic District Commission members, including a staff report as well as findings and pictures from a site visit. December 2008: The Board of Commissioners discuss a right-of-way and sidewalk concern in front of the former inn. The town and owner agree to leave the situation as is. The board amends the Zoning Ordinance to include “event center” as a special use within the Central Commercial zoning district. “Event Center” is a combination of restaurant, bar, lodging, nightclub and/or meeting space. January 2009: The town conducts a public hearing on the demolition-by-neglect complaint. The ruling confirms that demolition by neglect is occurring and orders specific repairs with time frames. A timeline of activities related to the property is created. March-November 2009: Official staff site visits are conducted to check on the completion of the repair order’s items; when the work ceases, enforcement begins. November 2009: A final zoning violation notice is sent to the owner for failure to comply with the Prevention of Demolition by Neglect Order. The property owner appeals to the Hillsborough Board of Adjustment. March 2010: The Board of Adjustment upholds the zoning officer’s decision. June 2010: The town files a lawsuit against Colonial Inn LLC seeking to compel compliance with the repair order. September 2010: The town receives a complaint letter that the structure does not meet the Hillsborough Minimum Housing Code. December 2010: Court issues an order granting a default judgment for the town, directing repair work to commence by Jan. 14, 2011, and to be completed by April 30, 2011. The order also provides that judgment may be entered for the town in the amount of $5,000 if the work is not completed in a timely manner and authorizes the town to complete the work, in its discretion, and to charge the cost of the work as a lien against the property. February 2011: The town adopts the Unified Development Ordinance to replace the Zoning Ordinance. The Unified Development Ordinance creates a “Central Commercial Special Use” zoning district intended for land uses permitted in the Central Commercial general purpose district that warrant special consideration. The district requires the submittal of a detailed special use permit application with the rezoning request. This change allows the town and property owner to agree to conditions on the rezoning and to limit uses to those detailed in the application. September 2011: Town staff conduct a Minimum Housing Code inspection of the structure. October 2011: The town obtains a judgment against Colonial Inn LLC for $5,000 based on the owner’s failure to complete repair work in a timely manner per the December 2010 court order. November 2011: The town conducts a Minimum Housing Code hearing, finding that the structure is not fit for human habitation and cannot be occupied. The repair order provides a list of work necessary to reoccupy the structure and a list of work necessary to be in compliance with the Minimum Housing Code. The property owner appeals the ruling to the Board of Adjustment. December 2011: The Board of Adjustment upholds the Minimum Housing Code finding and extends the deadline for the owner to vacate to Jan. 16, 2012. May 2012: The town commences summary ejectment proceedings against Francis Henry and Colonial Inn LLC to remove Henry from the premises. The judgment is entered on May, 29, 2012. March 2013: The town adopts a Future Land Use Plan, which places the property at 153 W. King St. in the Town Center category, allowing for the possibility of rezoning to the Central Commercial Special Use Zoning District. The district allows event centers and other uses similar to the former Colonial Inn operation. June 2014: The property owner files an application for a Certificate of Appropriateness for permission to demolish the structure. August 2014: The Historic District Commission conducts a hearing on the Certificate of Appropriateness application and unanimously denies the request for noncompliance with the Hillsborough Historic District Design Guidelines. The property owner appeals the commission’s decision to the Board of Adjustment. The appeal is scheduled for review. October 2014: The Board of Adjustment conducts a hearing on the appeal and unanimously upholds the Historic District Commissions decision to deny the Certificate of Appropriateness application. November 2014: The Board of Adjustment’s formal finding on the decision to deny the Certificate of Appropriateness application is adopted at its Nov. 12 meeting. The property owner has 30 days from the receipt of that formal ruling to decide whether to appeal the decision to Orange County Superior Court. December 2014: The deadline for an appeal to Orange County Superior Court passes, and no appeal is filed. The denial of the Certificate of Appropriateness application stands as final. January 2015: The Board of Commissioners adopts a resolution documenting the town’s intended actions toward preserving the former Colonial Inn. The board also approves contracting with Development Finance Initiative of the UNC School of Government for advice on redevelopment options for the property. July 2015: The town fire marshal issues an Order of Evacuation, stating that no one may enter the building for any purpose not described in a permit issued by the Orange County Building Inspections Department, only licensed contractors can work in or around the building, all combustible materials must be removed and that the town would take measures to secure the building and prevent unauthorized access. The owner is ordered to bring the building back to a safe condition. August 2015: The town secures the building by boarding the windows and doors. October 2015: The town fire marshal issues a Notice of Failure to Take Corrective Action for not bringing the building back to a safe condition. The Board of Commissioners adopts a resolution to commence eminent domain proceedings. January 2016: The town meets with representatives of the owners, who agree to allow appraisers hired by the town to inspect the property. March 2016: Following demolition of the newer back section of the building and remediation of other fire hazards, the fire marshal lifts the evacuation order. July 2016: The town, with direction from the Board of Commissioners, files an action in Orange County Superior Court to begin formal legal proceedings to acquire the property by eminent domain. On July 28, 2016, the Town announced that they had filed an action in Orange County Superior Court to begin legal proceedings to acquire the Colonial Inn by eminent domain. The Town placed a deposit of $250,000 with the Orange County Clerk of Court, which appraisers hired by the court determined to be the fair market value of the property. On May 10, 2017, the Town announced they had agreed to withdraw the Eminent Domain filing in order to give Henry a year to sell the property. To me, this is an inexpicable decision, as Henry has had years to sell the property - allowing it to be damaged and deteriorate further while he likely engages in some shenanigan like selling it to his brother would be a terrible path. I'm not sure if there's more to the story, but it feels like the Town bought into the b.s. Fortunately, the building sold in January 2018; Allied DevCorp. LLC paid $800,000 for the property. Per the Durham paper, the new owners plan to operate the inn as a boutique hotel with a restaurant, bar and small event space. Here's hoping that it works out.